My name is Nick Craft, and I’ve been a songwriter and musician since my teenage years, when I formed the psychedelic rock band Sidewinder with my brother Martin. 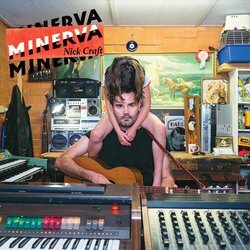 Minerva is my first solo record, and one I'm incredibly proud of. I've worked hard to invest the lyrics with a depth and meaning that's drawn as close to poetry as I'd care to get, looking at bigger themes that I've ever taken on before. These include the realities of what it means to get older and wrestle with our own transience. How love comes in different forms at different times. How to negotiate the precarious balance of hope and optimism on one hand, with the pragmatism and melancholy on the other. How work and fatherhood bring the elation of self-fulfilment alongside the bleak obliteration of the self, and how these opposites can sometimes manifest themselves concurrently. How the pram in the hall can be used as a source of deep and genuine artistic inspiration, rather than an obstacle to it. I think it's the best songs I've ever written, and the best music I've made. Of course, you're welcome to get in touch to tell me I'm delusional, if you disagree.